As we frugally rv full time, we always learn something new, like the importance of rv roof vents and covers. Since 2009, we've lived in a travel trailer and a motor home, and now a 5th wheel - all about 30 feet long, with roof vents on top which is standard if you like to breathe! We discovered many pros and cons about using the standard crank vents throughout our travels. We loved the ventilation, but found them useless on rainy days, always worrying they would blow off down the highway if we forgot to lower them. Also, I cannot emphasize enough how much I cringed at the sun in my eyes at 6am each morning! Our travel trailer and current 5th wheel had three roof vents in the same locations (bedroom, bathroom and living room) and our former motorhome had only two (bathroom and kitchen) - so we are quite used to the ups and downs of these vents in various locations. After using these covers on our campers, what we've discovered is this: these affordable covers are all "pros" - there are no "cons" to these things! RV Roof Vents And Covers: Why Does My Camper Vent Need A Cover? SO WHY AGAIN DO I NEED THESE THINGS? KEEPS OUT THE RAIN - My fellow rver, when you crank your typical roof vent up for ventilation, what happens when it rains? Nothing "magically" stops rain from coming in (unless you are parked in a warehouse, of course)! Well, these roof vents will! There is nothing worse on a hot, rainy day than having to close up the rv ventilation! So for rvers like us, the number one reason to get these covers is to have ventilation around the clock, even in the rain. VENTILATION WHILE TRAVELING - When driving long distance, have you ever stopped off at a rest area to grab lunch in the camper, only to discover it is uncomfortably hot and stuffy inside? Now you can keep your roof vents open because they won't rip off while driving 60mph and fly down the highway - they are protected by the cover. VENTILATION ON WINDY DAYS - Just like the rain example, on windy days we would never open our vents because we feared they would suddenly disappear into the next county, compliments of the wind ripping them off. You can have ventilation anywhere, anytime. VARIOUS SHADES ARE AVAILABLE FOR SUNSHINE ISSUES - Whether you love the bright light in the morning over your bed, want it completely blackened out or are more in the middle (gray area, so to speak), you now have a means to control it. Buy the right shade for your sunlight preferences. RV TIPS: Should I Get A Black Vent Cover For RV Roof? 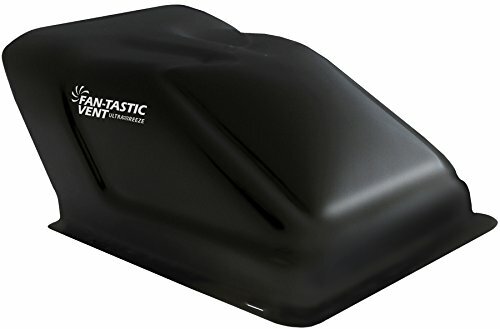 You may like the sleek look of black roof vent covers...and you may be asking yourself SHOULD I BUY A BLACK COVER? THEY ARE SO COOL LOOKIN' LIKE ME!? But hold your horses for just a second! As I mentioned, the morning sun in my eyes in our bedroom vent drove me crazy - we didn't want to cover the vent up from the inside, because the idea was ventilation and that would have closed it off! So in our situation, black covers were ideal. 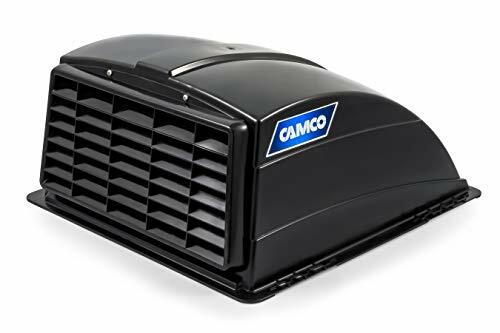 What's nice about Camco vent covers is that their standard cover comes in five different colors (white, champagne, silver, black and smoke), and they are more affordable than the competition yet receive the same superior reviews as the others on the market. They come with hardware, are easy to mount onto your existing roof vent, can be easily cleaned out and do a great job! 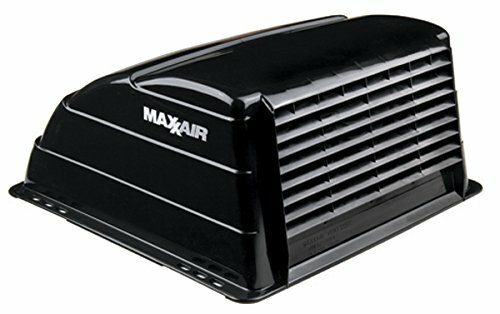 Though they cost a little more than Camco, many people swear by the Maxxair roof vent covers. Reviews show that rvers love 'em for the same reasons - durable, easy to install, hardware included...so you can't go wrong. As you will see below, these camper roof vent covers are available in only three colors (no champagne or silver offered by this brand). 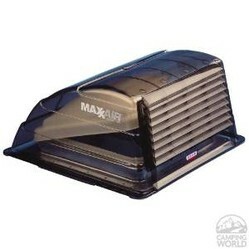 Maxxair Smoke Vent Cover - Protects your RV interior from rain and hail. America's fresh air choice since 1988. Proven, super-tough one piece design. Limited 3 year warranty. Though Camco may have more colors to choose from, Maxxair now has more STYLES. As you will see below, they've created a roof vent cover that has more ventilation space and named it, oh so cleverly, the Maxxair 2. I've only listed one below, for your review, but they are available in white, black, smoke, shell white and almond, so you are certain to find the right color for your roof. Or you can always be unconventional and get all different colors of roof vent covers...you'll be the talk of the rv park! What Roof Vent Color Would You Prefer In Your Bedroom? So there you have it...all the information you need to get roof vent covers on that recreational vehicle. No matter which brand or color you choose, you will wonder (like we did) why you waited so long to get them. Honestly, do we really need to sit under an umbrella in the camper when it rains, just to get some air flowing through? The roof vents will only crank about 3/4 of the way up. The ventilation is just fine and that is plenty high enough. Also, these screw into your existing roof vent, so if you aren't handy or able to get on your roof, you will need to hire someone for about 30 minutes of labor. You won't be disappointed with this rv accessory - it made such a difference for us. You see these on campers everywhere, old and new....because they are a necessity in the rving lifestyle. Happy Trails (and happy ventilation) To You! Any Camper Vent Cover Comments? frugalrvers, How much cleaning do you need to do to maintain the two white vents' color? Hi Robin! Great article on roof vents - I don't need one, but I can see why they would be very important to keep the air flowing in the RV.